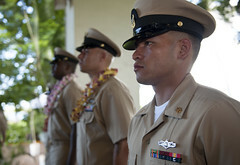 Following six weeks of training, 32 Sailors assigned to various Hawaii commands received their gold anchors, chief combination covers and joined the Chiefs Mess during a chief petty officer pinning ceremony Sept. 16. 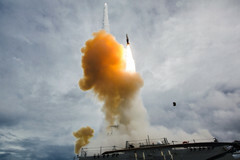 Royal Canadian Navy, Japan Maritime Self-Defense Force and U.S. Navy ships will participate in a task group exercise off the coast of Southern California, Oct. 20-31. 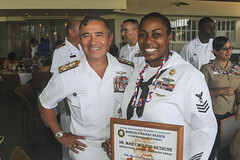 Yeoman 1st Class Latoya Calvin received the National Association for the Advancement of Colored People (NAACP) Dr. Mary McLeod Bethune Inspirational Leadership Award Sept. 13. Ships and aircraft sank the decommissioned former USS Fresno (LST 1182) as part of the exercise Valiant Shield 2014, Sept. 15. More than 18,000 joint force service members from 30 units, including 200 aircraft and 20 ships are taking part in the exercise which began Sept. 15 in and around Guam. 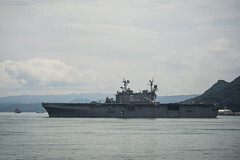 The Navy's newest amphibious assault ship, the future USS America (LHA 6), is scheduled to arrive at its new homeport of San Diego Sept. 15 to make preparations for formal commissioning. 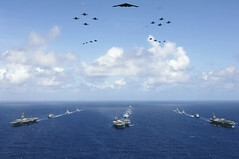 Over 18,000 U.S. Pacific Command personnel will participate in the exercise, scheduled for September 15-23. 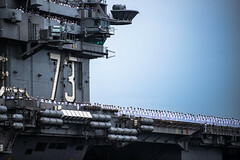 The U.S. Navy's forward deployed aircraft carrier departed Fleet Activities Yokosuka, Japan, Sept. 2, for operations in U.S. 7th Fleet. 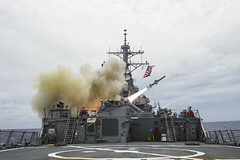 More than 100 U.S. Navy reservists from 120 from multiple commands in the U.S. and the Pacific region, provided key support during this year's Ulchi Freedom Guardian exercise. 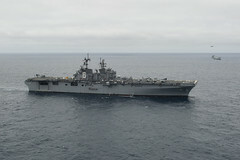 USS Peleliu (LHA 5) departed Sasebo, Japan, Aug. 29 to lead the Amphibious Ready Group on patrol in the Western Pacific.